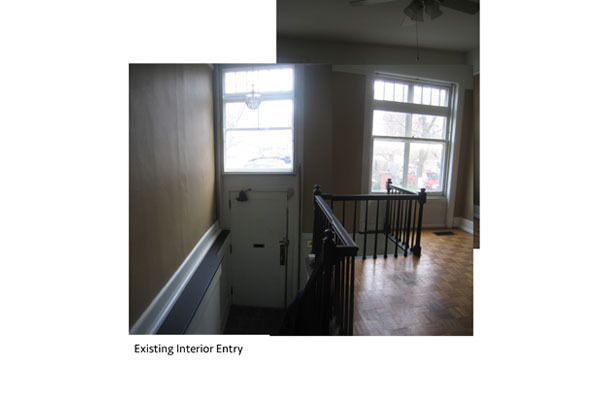 Above are two images that illustrate the alteration of the front living room. They are shot from almost the vantage point. 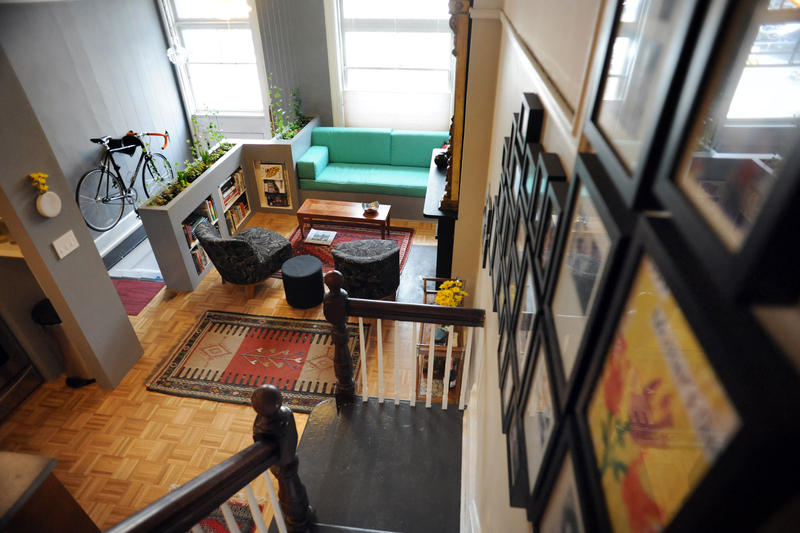 What was once an unusable space is now designed to accommodate a cozy living room. The image on the left was taken in 2014 and the image on the right is from when we purchased the house in 2010. Located in the historic Washington Park district of Albany, NY. This home was built in 1881. It had a unique past including Lockrow’s Bookstore. The project utilized New York State homeowner’s Rehabilitation Tax Credits and was able to receive 20% back on the final cost. Just 13 feet wide, this house provided unique opportunities for dual functions. The renovation included adding a kitchen to the main floor (the existing kitchen was in the basement), sanding the floors, reorganizing the entry, and creating a built-in couch/daybed in the front window. Here are a few photos that document the process. The challenge: It was very hard to utilize the space by the window especially since the floor jogged and the railing was not in line with the large front window. As the image shows below, the space had some challenges. We could not fit furniture comfortable in the space because of the lack of usable space. The goal was the create a usable space that could accommodate a living room and created privacy when the front door was open to the street. The solution was was specific to the space. We designed a built-in couch with teal cushions created by National Upholstering, we were able to hide the jog underneath and a false back that can be removed to create a bigger space for lounging or a bed. Ivy in the planters with built in bookshelves below has begun climbing the wires that connect the planter to the 9 1/2-foot ceiling. Furthermore, my husband is a daily bike commuter and we wanted to utilize the entry for his bike. We left no space without a programmed use.